saw these at the brisbane show the other weekend. seriously thinking about one. are they still the same or have they fixed a few of the issues and are they still worth it? The Minute You Stop Living - You Start Dying. Last edited by Kingsthorpedavid on April 4th, 2012, 8:16 pm, edited 4 times in total. I have used mine in a few places now including Fraser with no problems. I drilled holes in the pig through the leg stubs, then 6 holes in each leg. This draws a little more air but ash can quickly cover it. Mostly it falls and collect in the bottom of the legs though. 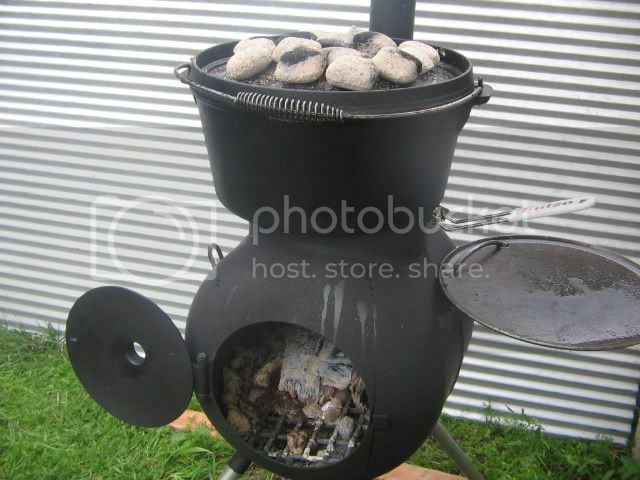 It works great with logs as in the picture above but I have concluded it does not get hot enough with heatbeads or manufactured fuels like sawdust logs. These might be all right for camp stoves on extended cooking times, but for steaks or mince, burgers etc they dont work. Its nice to be able to have a fire everywhere we go especially as its getting a bit colder now. I cook steaks and burgers all the time, plus the usaul stuff in the camp oven on it. Not a problem, but I use timber as my fuel. But places like Fraser have compete fire bans so timber as a fuel is out. With timber its great and you need the diffuser to take the edge off. But the reason we bought it was to be able to have some heat in the colder months even in national parks. I'm selling mine viewtopic.php?f=17&t=129146 not getting away much any more. Call them, details on the website, they are great helpful people to help out with small problems. They told me to just set the plate in the tube and lift or bend down the plate to make it swing free and level. Also grind off the loop on the plate so when the camp oven is on the right hand side plate, it can rest right up against the body of the "pig" to cook slowly after say haf an hour on the top to get going properly, but put a half a dozen coals or heat beads on the lid- so great for lamb so that it falls off the bone. Do your greens in an alfoil pack on top of the coals on the lid for 8-10 mins. Apart from that, it's just great, but I think think the new door with holes in it would just make it right. What a great unit! Folks, i was wondering what these are like in the winter dispersing heat outside? 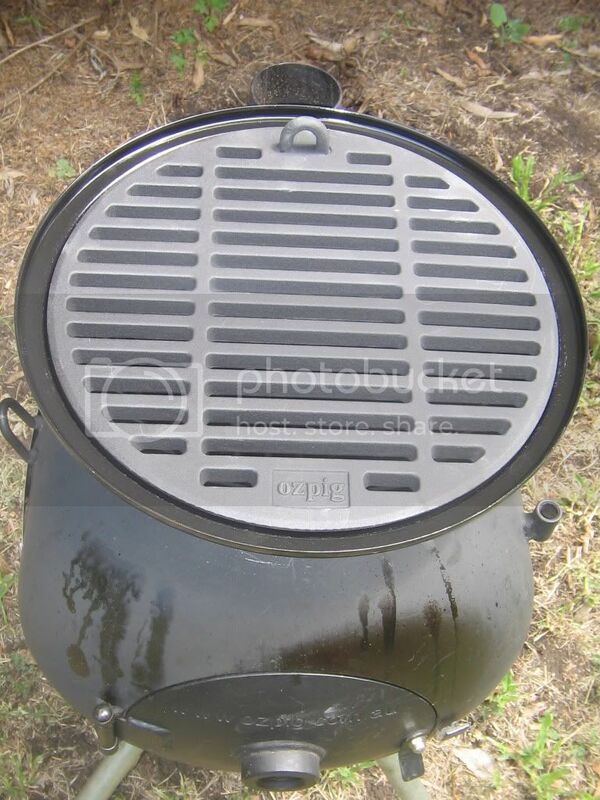 I'm thinking of buying one for an outdoor stove/oven, but also confined outdoor heater during the cold winters. Throws a fair bit of heat with some nice logs burning but I think the pictures on the site of 10-15 people sitting around it is a bit optimistic. For our needs it should perform well. RangerPunx wrote: Throws a fair bit of heat with some nice logs burning but I think the pictures on the site of 10-15 people sitting around it is a bit optimistic. For our needs it should perform well. I will just add to my previous post in regards to keeping warm with it. We went to Straddie on the weekend and it was really windy. Anyways we cranked up the pig with some logs I have had seasoning for a while. I have found that using the $3-$4 bunnings sawdust logs in the middle of timber helps get everything started and keep it going whilst the bigger stuff gets up to temp. Now with just the 2 of us we had to sit right on top the pig to feel any heat coming off of it. I could comfortably have my bare feet next to the door opening. Problem with it in the wind is that you need to be down wind of it to feel anything but then that puts you into the path of the smoke as you will have the top opened to get air into it. Just something else for the missus to complain about. I have also noticed I have to thoroughly clean it after every outing and then redress it in a thin oil to keep it from rusting. The original paint sucked and I havent really got time to rub it down and recoat it. After this trip I am having second thoughts on the OZpig. In theory I love it but in practise it can be very frustrating. When its going well its great, but generally that might only be for a night or 2 whilst away. I think its probably going to be one of those items that fades away never to come on trips again. Seemed like a good idea at the time but is just something else to pack and lug around but with no real benefit. 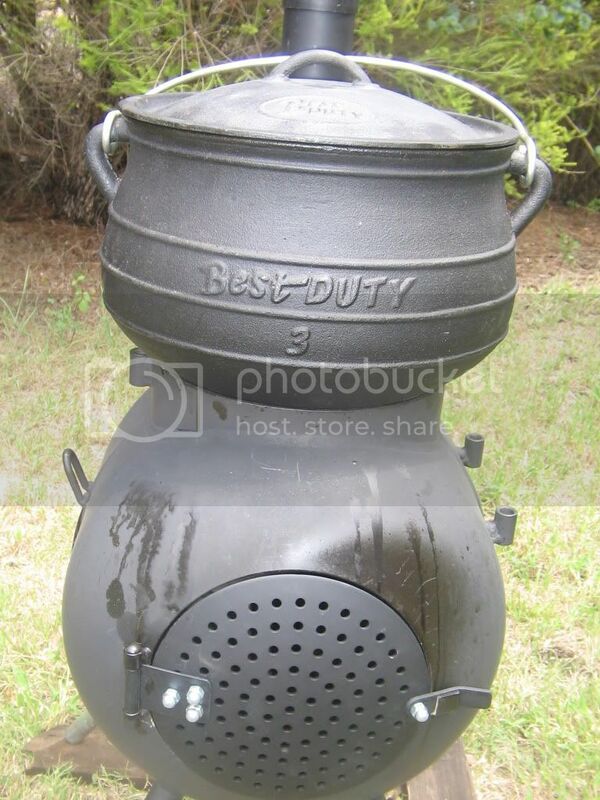 Geoff3DMN wrote: The downside of the ones made out of 9Kg gas bottles is that the metal is thicker (gas bottles are pressure vessels after all and they need to be thick). That means the home made ones are quite a bit heavier which means they aren't an easy one handed, all in one bag easy carry which is a big part of the appeal of the OzPig. Last time I checked the OzPigs ARE made from gas bottles. At least I would put fair money on the fact that mine is! I made one a couple of years ago. Click on the link below for a step by step guide to make one. 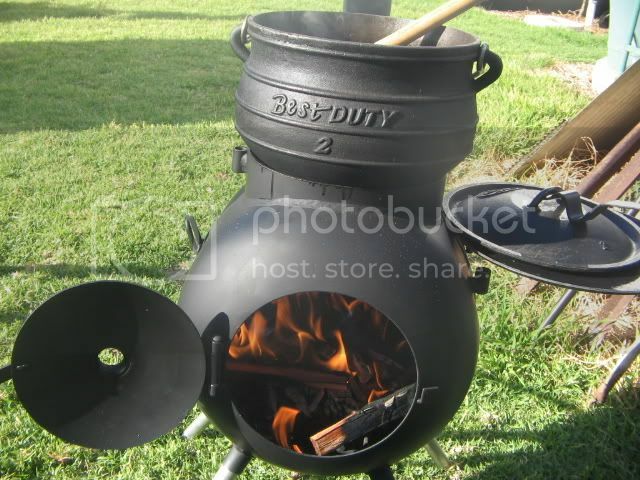 It is with out a coubt one of the best camping tools ever. I fully recommend the ozpig or a home made variety. The one I made is almost identical to the Ozpig but to be honest I think mine is better. 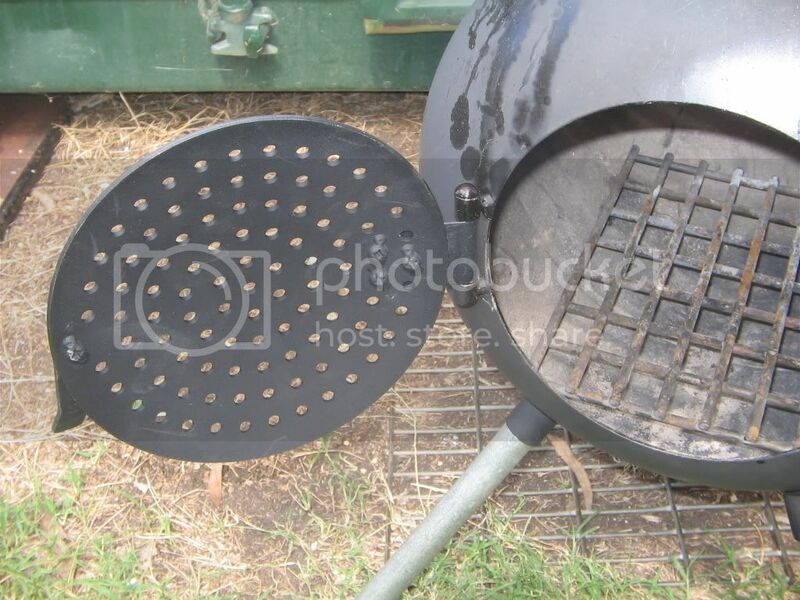 The one I helped dad buy he got the vented door with all the holes and he also drilled some of the holes along the bottum bigger so as to create more air flow under the rack inside the pig. We also got a couple of extra flu's to create more draw from the flu. 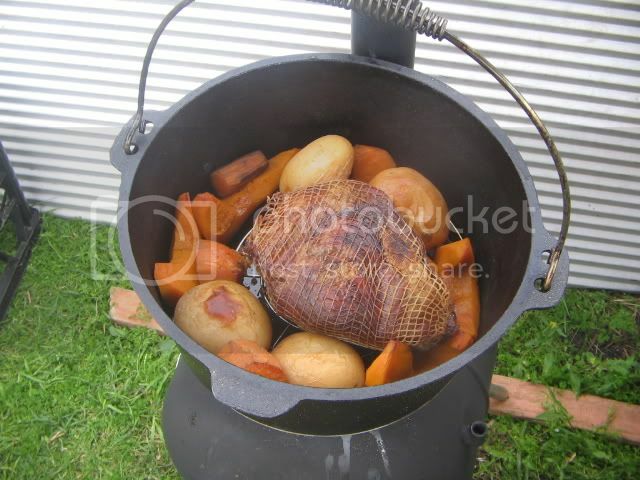 Ours goes good as long as you dont put to thick of timber in it, soon as you do it smokes like a mongrel. He has it sitting at the open end of his annex (lives in his van ). Not to much is better then sitting around it with a cold beer after work. We have one and love it, it certainly pumps enough heat, but as mentioned it doesn't draw the best, I just wedge the door open with a piece of reo bar that i also keep in the bag. It is certainly economical on wood, we always transport ours with the belly full of wood incase we can't find or collect any where we're going, that's usually plenty for a night at least.